Hello everyone, hope all of you are in the pink of health! We are here to share with you the features that were rolled out in our upcoming update, Teamie Zaffre (1.49). This update primarily focuses on engaging users on the platform by rewarding them with badges, which will provide a visual identity for their participation and hard work on Teamie. The introduction of badges, along with the ability for learners to see their progress in a classroom/module sums up this update. For a deeper look, let’s dive in. Gamification provides a unique way to engage users on a platform by adding elements that encourage engagement by rewarding user participation. 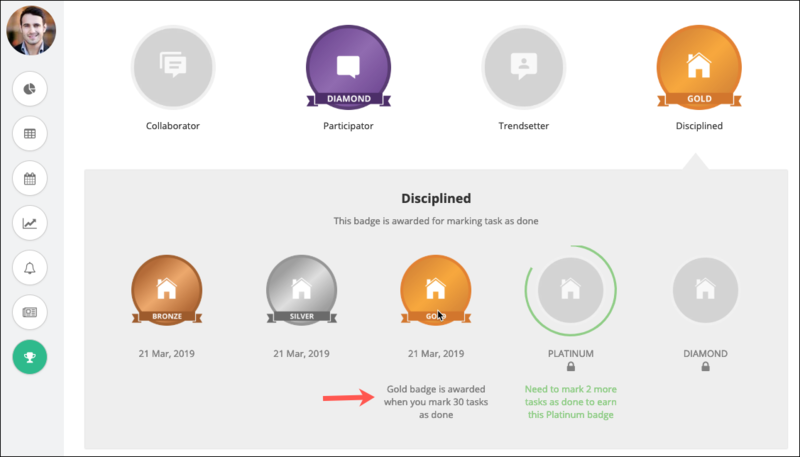 With badges, we wish to achieve an even higher level of engagement & stimulate collaboration within teams and also motivate individuals to achieve more on the platform. From Teamie Zaffre (1.49) onwards, badges will be awarded to both Learners and Instructors for their activities on the platform over time. Let’s see how it will work for each role. Note: The aforementioned badges can be configured on request, for e.g. one of the badges can be disabled from our end if you do not want it on your site. To earn a bronze badge, ’10’ counts of an activity needs to be done. 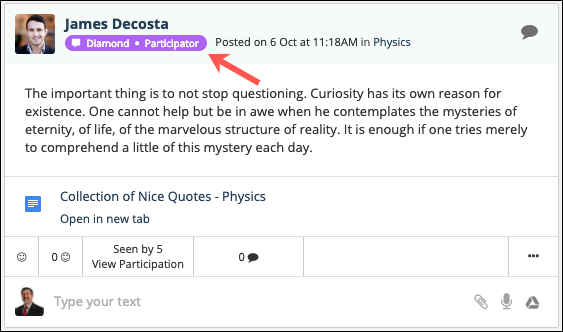 For example, a learner will be awarded a Bronze Collaborator badge when they have posted at least 10 thoughts / questions. Similarly, for posting ’20’, ’30’, ’50’, ‘100’ posts, learners will be awarded badges of Silver, Gold, Platinum and Diamond respectively. Note: These target counts are the default target counts that can be changed while enabling Badges on your site. 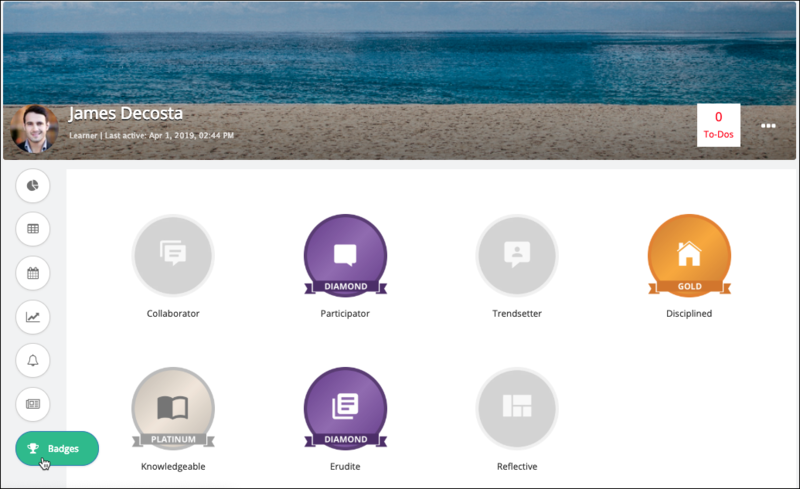 The Badges tab has been added to the learners’ profile page. All the badges that the learner will earn will be listed there. Learners can also view the three highest badges they have been awarded by clicking their profile image. A See All Badges button will also be present to navigate directly to the Badges tab on the profile page. On the Badges tab, clicking on a badge will open a detailed view. This view shows the badges earned by a learner along with the dates on which they were awarded. Hovering over a badge will show the activity count required to earn the badge. Moreover, a circular progress bar and remaining activity count will indicate how close the learner is to achieve the next level for a badge. 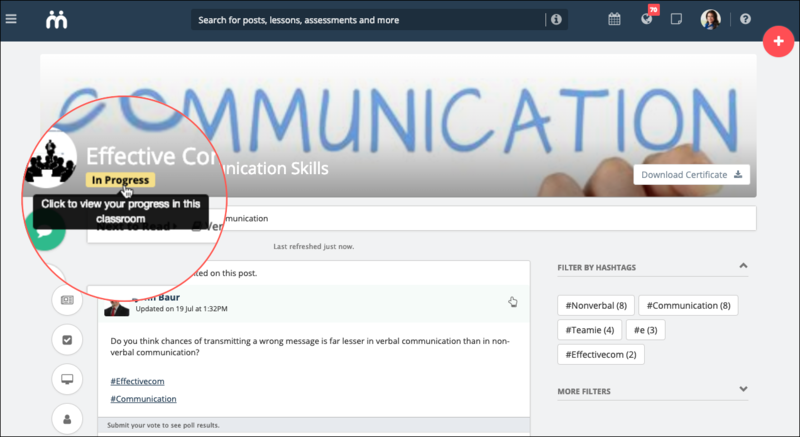 The highest badge that learners are awarded most recently will also be reflected on their newsfeed posts. This way, they can see each others’ badges and get motivated to engage more on the platform. 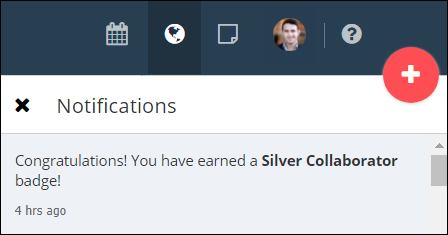 The way this will work is that the highest badge a learner has been awarded most recently, will be shown as a tag in front of his/her name on the posts created by them. 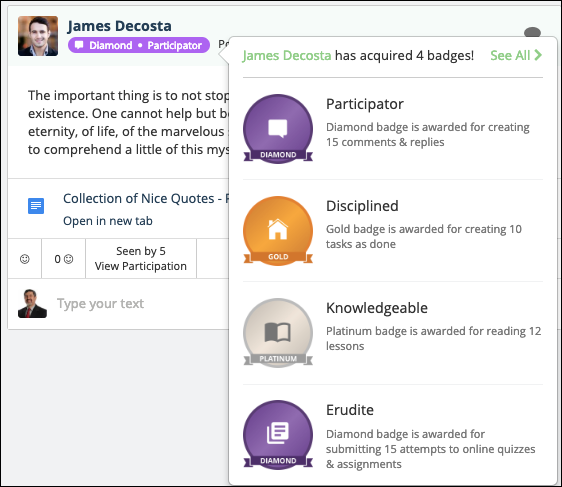 Clicking on the tag will open the list of the five highest badges that the learner has been awarded. 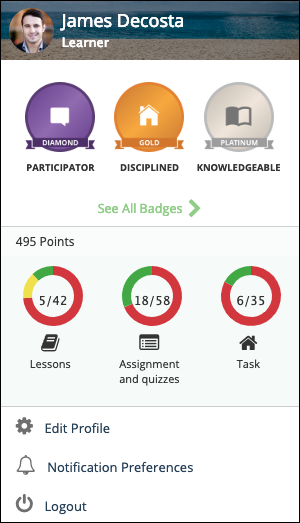 You can click See All to navigate to the Badges tab to view all the badges that the learner has been awarded. 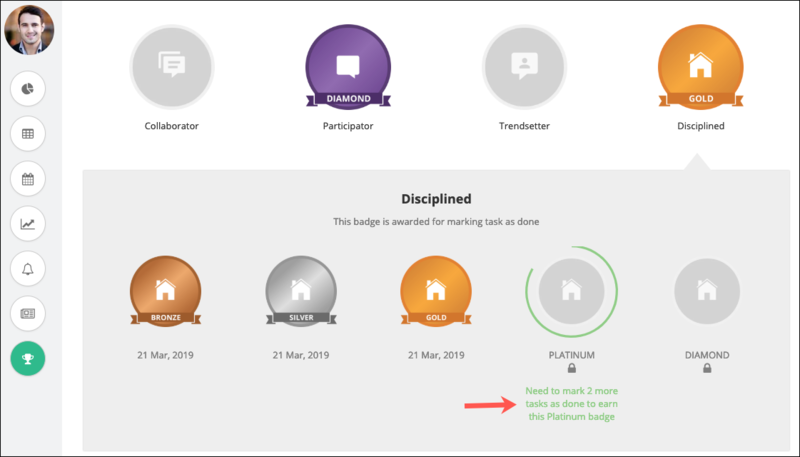 Furthermore, a notification would be sent out every time a learner earns a badge in order to motivate and keep him/her engaged on the platform. Tapping on the notification will take the learner to the Badges tab on his/her profile page. And will be visible under their profile and on newsfeed. Note: Badges will be awarded to instructors based on their site level role i.e. if an instructor is a learner in any of the groups, then they will not earn badges meant for the learner role. Administrators, kindly take note that Badges is an optional feature and you need to write to us in case you wish to enable this on your site. You can let us know how you wish to configure the target counts that are required to earn different badges or disable any of the badges, if required. 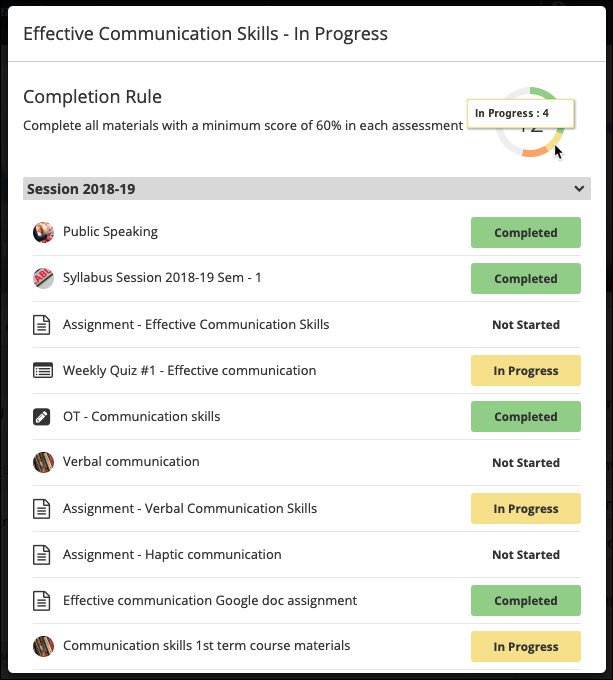 Currently, instructors can view learners’ progress from the learner progress view. This view shows the learners’ progress on the materials and homework (task) posts at a glance. 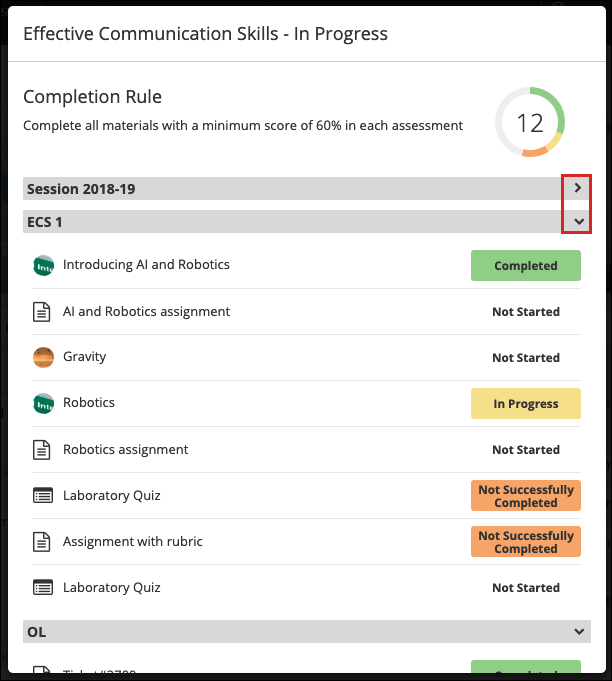 If the Classroom Completion feature is enabled on a site, the instructors can set rules for the final Completion Status of a classroom. Now, for the Classroom Completion feature enabled sites, learners will also be able to view their progress in classrooms. As a learner, you need to click the completion status label on a classroom’s cover image to view your progress in that classroom. The completion status popup will open. On top, the classroom name will be mentioned along with the current completion status (Completed, In Progress, Not Successfully Completed, Not Shared). Below that, the completion rule set for that classroom will be present. Then, all the materials will be listed in their respective sections along with their completion status. All the sections will be expanded by default. You can collapse them by using the sections’ down arrows. A donut chart will be present to show the data in a format that is much easier to interpret and read. The count for the total number of materials completed by the learner will be mentioned in the centre of the donut chart. You can also hover over different statuses on the chart to view the count of material associated with that status. 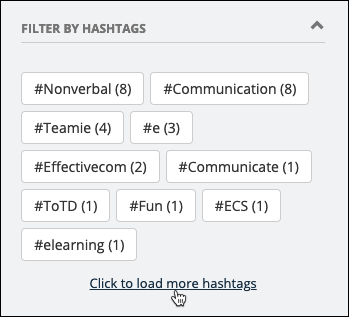 Currently, by default, the top 10 hashtags are shown in the filter section. Now, we are adding a “View more hashtags” link in this section. Clicking on this link will load the next 10 hashtags in the order of popularity and this process can be repeated to view all the hashtags in a classroom and quickly filter posts by them. So, that’s it for this update. If you have any feedback for our gamification approach, do share with us. We will be glad to hear! Till next time, goodbye, take care and stay collaborative! …………………………………. end of document ………………………………….